The Niarchos Diamond gets it's name from the Greek shipping magnate Niarchos Stavros Spyros, brother-in-law to the famous Aristotle Onassis, and reputed art collector and investor, who purchased the diamond in 1958, for $ 2 million, from Harry Winston, and presented it to his wife Charlotte Ford. The Niarchos diamond is a 128.25 carat, pear-shaped, colorless diamond of unknown color and clarity grade. But, the master cutter of Harry Winston Inc. New York, Bernard de Haan, referred to the rough diamond as the "Ice Queen", because according too him the rough stone would have been hard to spot in a bucket of ice cubes. This gives an indication as to the color and clarity of the diamond. A satellite stone of the Niarchos, an emerald-cut, 39.99-carat diamond, which was purchased by Sheik Ahmed Hassan Fitaihi in 1991 for $ 1,870,000, was graded by the G.I.A. as D-color and VVS-1 clarity, and bears the name "Ice Queen". Thus the Niarchos diamond was most probably a D-color diamond of a similar clarity grade. Being a D-color diamond, the Niarchos is a type IIa diamond, which is nitrogen-free and structurally perfect. These diamonds are known as the "purest of the pure"of all diamonds and constitute 1-2 % of all naturally occurring diamonds. The presence of nitrogen and structural distortion are two factors that can induce colors to diamonds. In the list of famous D-color diamonds about which information is available, the Niarchos is perhaps the 14th largest D-color diamond and the 5th largest D-Color, pear-shaped diamond in the world. The Premier diamond mine, situated in Transvaal, South Africa, was discovered in 1902, by Sir Thomas Cullinan, who later formed the Premier Diamond Mining Company. It was in this mine the world's largest rough diamond weighing 3,106 carats, was discovered in 1905, and was appropriately named the Cullinan diamond. During the long period of operation of this mine, it has produced some of the world's most outstanding diamonds, such as the Niarchos in 1954, the Taylor Burton in 1966, the premier Rose in 1978, and the Centenary diamond in 1986. The ownership of the Premier mines was subsequently acquired by the De Beers Consolidated Mines Ltd, and under it's management became one of the most productive diamond mines in the world. The Premier mines also became the source of exceptional quality fancy colored diamonds, including the very rare blue diamonds. But, during the last 100 years, production in the premier mine was not continuous. There were two major interruptions during this period, when operations at the mine were temporarily suspended. The first such interruption was during the outbreak of World War I in 1914, but after two years in 1916, work at the mines resumed again. The second interruption in production was much longer, and started in 1932 during the great depression, and continued until the end of world war II in 1945. Production started again in 1945, but was given an added boost in 1979, with the opening of the mine below the "Gabro Sill",a 70 meter geologic intrusion of barren rock which cuts right through the pipe some 400 meters below the surface. Production from this new source extended the life of the mine and was expected to enable production to continue for at least another 15 years. May 22nd 1954, was a routine day of operations at the Premier mines, when suddenly workers engaged in their monotonous duties at the grease tables of the recovery plant realized that a large gem-quality diamond had appeared on the tables. A quick and casual inspection of the diamond revealed that this was indeed an exceptional find. Further extensive examination revealed that the rough stone was internally flawless and weighed 426.5 carats, but was slightly chipped at one end, attributed to the stone's contact with the mine's underground crusher. The dimensions of the stone were 51 x 25 x19 mm. Sir Ernest Oppenheimer who examined the rough stone said, that it possessed the most perfect color of any diamond he had seen. The diamond which was still unnamed was dispatched to London, and included in a 'lot"of rough diamonds that was eventually sold by the Diamond Trading Company to Harry Winston Inc. of New York in January 1956, for a record breaking sum of Â£3,000,000. This was one of the largest ever transactions negotiated by the Diamond Trading Company. The Niarchos diamond yet unnamed was dispatched separately from the other diamonds, from London to New York. The diamonds reached the Idle Wild Airport, New York. on Feb 1st 1956. A messenger from a customs broker at the airport delivered a brown paper bag containing the Niarchos to the Harry Winston Inc. and an accompanying postman delivered three boxes to the same address containing the remaining stones sent by ordinary registered post costing only Â£1.75. The total lack of security for the diamonds although astonishing was an ingenuous method of avoiding undue attention towards the priceless items. The next formidable task was the cutting of the rough stone, to bring out the beauty and brilliance locked up within the stone for perhaps billions of years. Harry Winston and his cutting staff were confronted with the same age-old problem of deciding between historic value and marketability, that had baffled owners of extraordinarily large diamonds before. Finally after weeks of debating Mr. Harry Winston decided on a single large diamond, because he considered the historical value of creating one fine large diamond as more important, than creating several smaller stones, that would have proved easier to sell. The final decision having been made by Mr. Harry Winston, the team of cutters headed by Winston's chief cleaver and cutter, Bernard de Haan, who hailed from a family of hereditary diamond cutters in Amsterdam, set about the task of planning the cutting process. Several lead models of the rough and proposed finished gem were cast in order to guide them in their task. Bernard de Haan, was involved in the project for an entire year, before it was finally completed. The first step which took five weeks resulted in the cleavage of a 70-carat piece from the original rough stone. 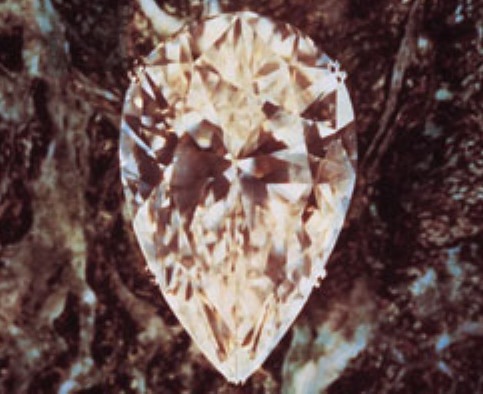 This was eventually transformed into a perfect 27.62-carat marquise. The second step, which took almost the same time as the first, involved the cleavage of another 70-carat piece from the stone, which was eventually fashioned into a top quality 39.99-carat emerald-cut diamond. After the first two operations, what remained was about 270 carats of the original rough diamond. Bernard de Haan then began in earnest, the faceting and polishing of this large piece, and after 58 days of continuous hard work a brilliant pear-shaped diamond weighing 128.25 carats, was fashioned out. The diamond had a total of 144 facets, 86 of which was around the girdle. The finished diamond was finally unveiled to the world on February 27th 1957, and was nicknamed the "Ice Queen"by Bernard de Haan, as according to him the rough stone would have been difficult to spot in a bucket of ice cubes. The April 1958 issue of the National Geographic Magazine, featured an article on diamonds, which also included the cutting process of the Niarchos diamond. the 128.25-carat pear-shaped diamond was then purchased by the Greek shipping magnate Niarchos Stavros Spyros for his then wife, formerly Charlotte Ford, for a reported $ 2 million. He also purchased the two satellite gems that originated from the 426.5-carat rough, the 27.62-carat marquise-cut and the 39.99-carat emerald-cut. Niarchos Stavros owned the largest private shipping fleet in the world, which consisted of more than 80 tankers, some of which were supertankers that set the world record for size and carrying capacity. He was the Brother-in-Law to the other famous Greek shipping magnate Aristotle Onassis. Niarchos was also a reputed connoisseur and collector of art works. His famous acquisition was the French impressionist art collection belonging to the American actor Edward G. Robinson, which he purchased for $ 2,500,000. The marriage of Niarchos to Charlotte Ford eventually ended up in divorce, but Niarchos retained the diamond, which came to be known as the Niarchos Diamond. He was generous enough to lend the diamond to many exhibitions, and in 1966 the Niarchos returned to it's country of origin, South Africa, for the famous Centennial "Jewel Box 1966"exhibition. Stavros Niarchos died in April 1996, and since then the whereabouts of the diamond are unknown. However 5 years before he died, in 1991, the 39.99-carat, emerald-cut, satellite diamond, came up for auction at Sotheby's of New York, and was purchased by Sheik Ahmed Hassan Fitaihi of Jeddah, Saudi Arabia, for $ 1,870,000. This diamond was graded by the G.I.A. as D-color and VVS-1 clarity, and today it is known as the "Ice Queen".